Clowns The three most celebrated are Joseph Grimaldi (1779-1837), the French Carlin (1713-1783), and Richard Tarlton, in the days of Queen Elizabeth, who acted at the galleried inn called the Belle Sauvage. "To sit with Tarlton on an alehouse signe." Bishop Hall: Satires. Source: Brewer's Dictionary. Grimaldi, Joseph (grimăl'dē), 1779–1837, English pantomime actor and clown. He made his debut at the age of three in Robinson Crusoe at Sadler's Wells, London. For many years he performed there and at Drury Lane. 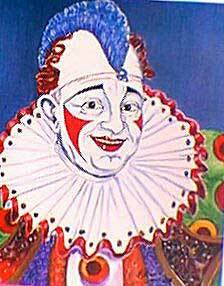 By the time he played the clown in his production of Mother Goose at Covent Garden in 1806, he was a legend. The songs he made famous were sung long after his death at the insistence of the gallery. See his memoirs (ed. by C. Dickens, 1838).